This post is sponsored by Gorton’s Seafood. All delicious views expressed are that of our own. 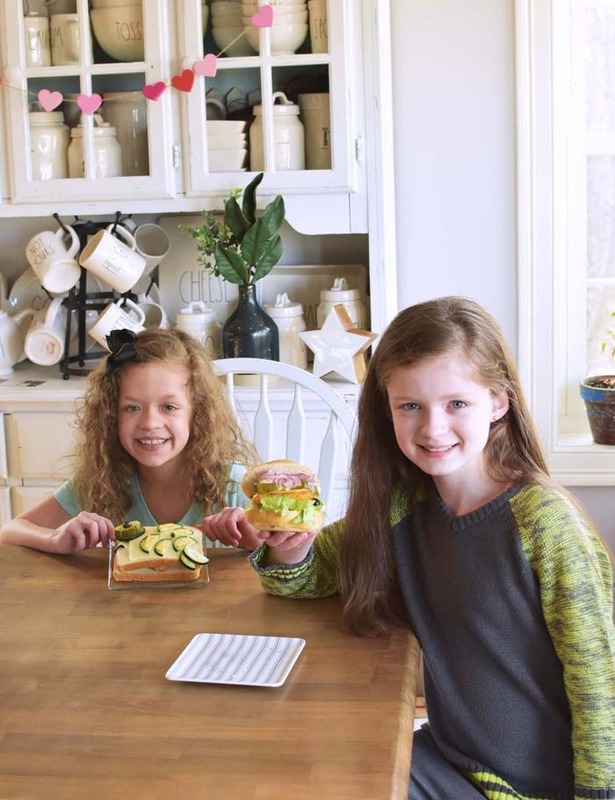 Two fun twists on a classic, these easy to make Fish Sandwiches appeal to both kids and adults. 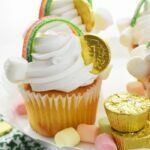 Best of all they are prepare with common ingredients for about $10! 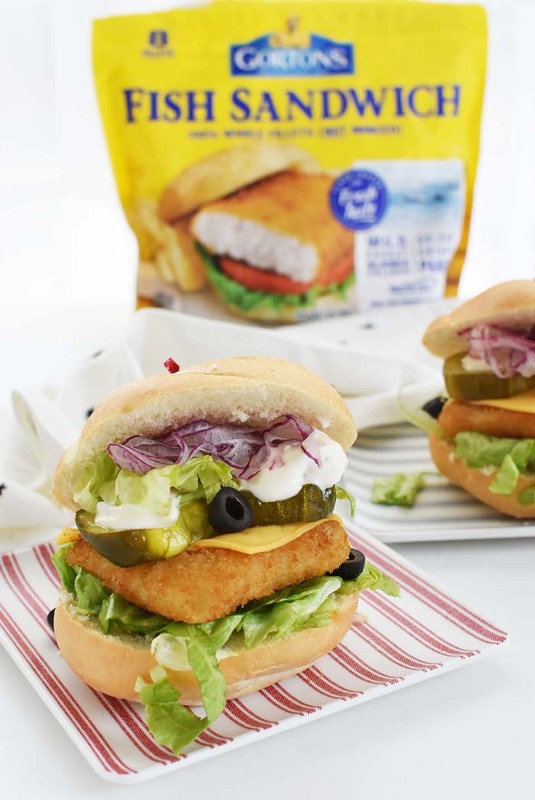 Easy dinners like fish sandwiches are some of our most go-to comfort meals that are easy to put together. Jared and I both grew up on eating fish sandwiches, or “burgers” made with Gorton’s Fish Sandwich Patties. 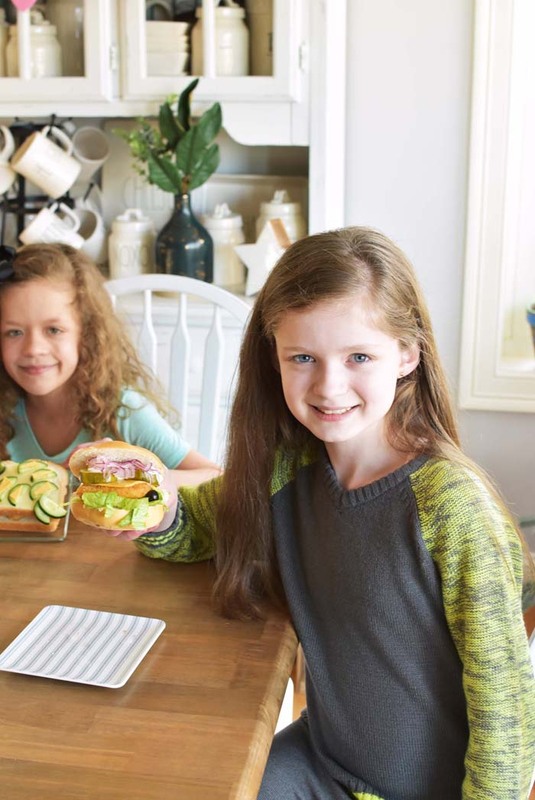 My mom would often make fish sandwiches on days where she wanted a break from cooking a full blast meal. We would always have them with oven baked fries or classic potato chips served with a pickle. 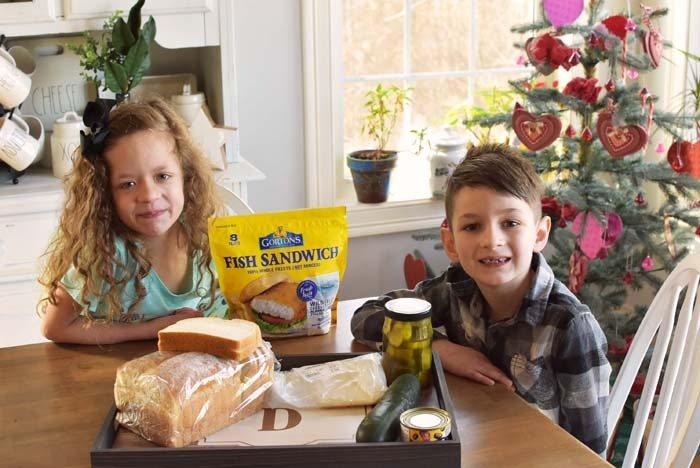 Now, fast-forward 20 years and our kids also love fish sandwiches, but 2/3 are not fans of ALL the fixings. My two youngest ones snub the tartar sauce, onions, and lettuce, but my oldest is game for all the toppings! So, since I like to be fun sometimes, I tried to be creative with my youngest two children’s fish sandwiches. Can you tell these are supposed to be little fish on the bread? Inside, they have melted American cheese, and Gorton’s Fish Sandwich patties. For the bread, I used a country white slice. 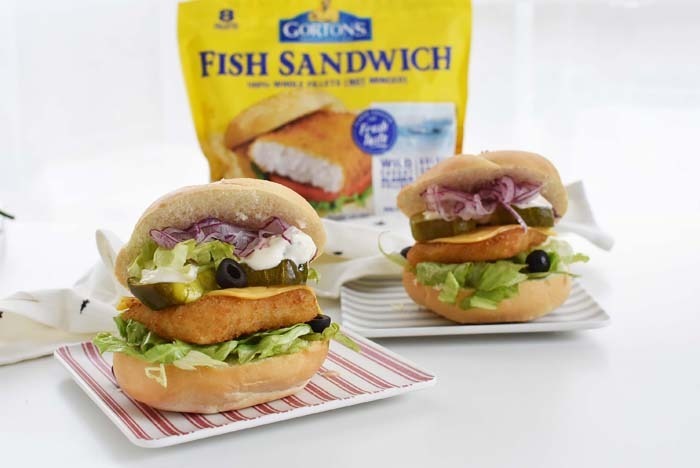 Since these bread slices are typically larger, you might want to add 1 1/2 Gorton’s Fish Sandwich Patties to each to fill the entire bread. For the base, we used white American Cheese, pickles for the eye area, and olive for the pupil/lips. Cucumber were used for the scales and fins. Little triangles of American cheese were used for scale detail. My kids literally helped plan these so forgive the fact that you might not think they look like fish. 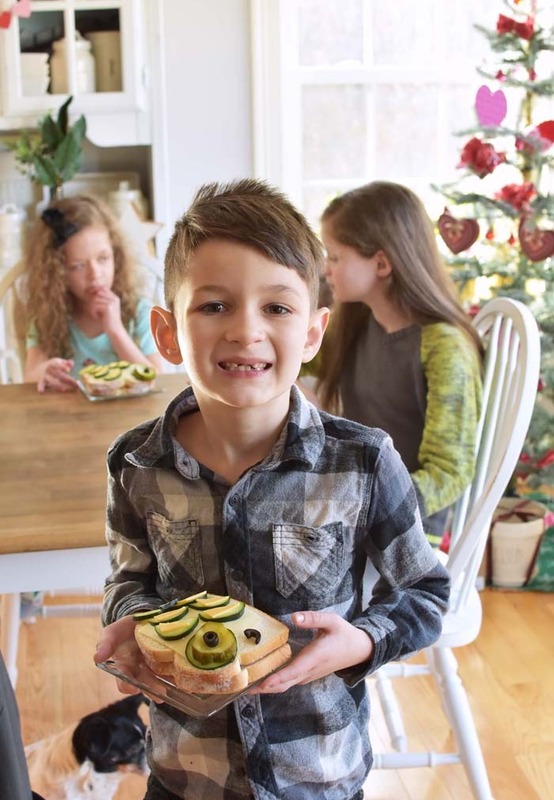 Kids play with their food, pick it apart and eat in “their” own unique way, so these kid-friendly fish sandwiches totally work. They got 2 thumbs up from the littles too! Now my oldest has developed her mom & dad’s taste buds which works for me. She loves the New England Ultimate Fish Sandwich I made for her and her dad. I definitely made that title up, but you know what? It works! When I was a kid, my mom always used yellow American cheese (deli style) for our fish sandwiches or burgers. 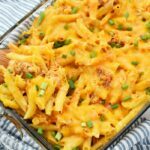 She would add the slices right as she pulled them out of the oven and that would allow the cheese to melt over the patty perfectly. So, for the best fish sandwich, I stick with varieties of deli-style American cheese. 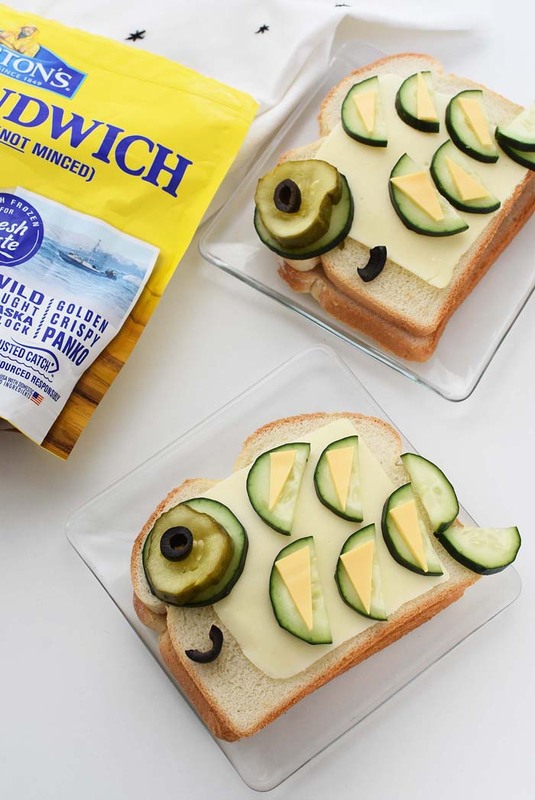 Every fish sandwich needs a nice crunch so I added cucumber, thinly sliced red onion, lettuce, and olives to our sandwiches. To tie the flavors together, I made a basic tartar sauce with 1 part pickles, and 2 parts mayo. 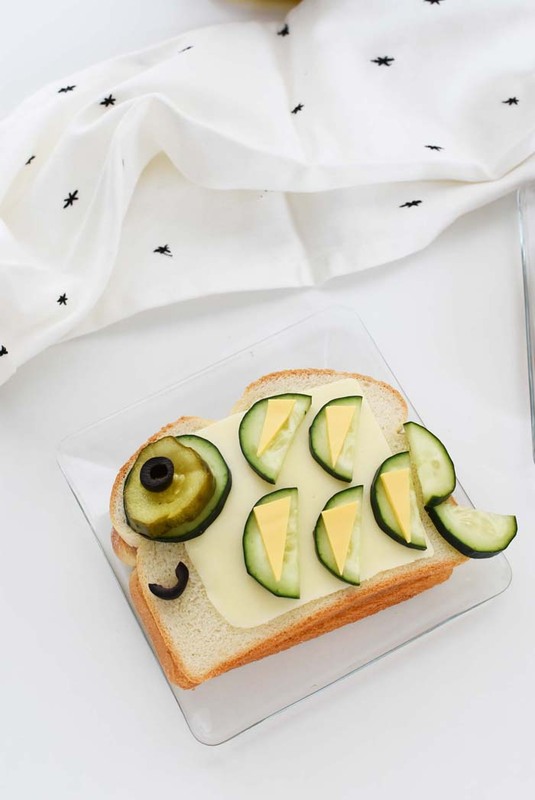 This gives the sandwich that extra “zest”. 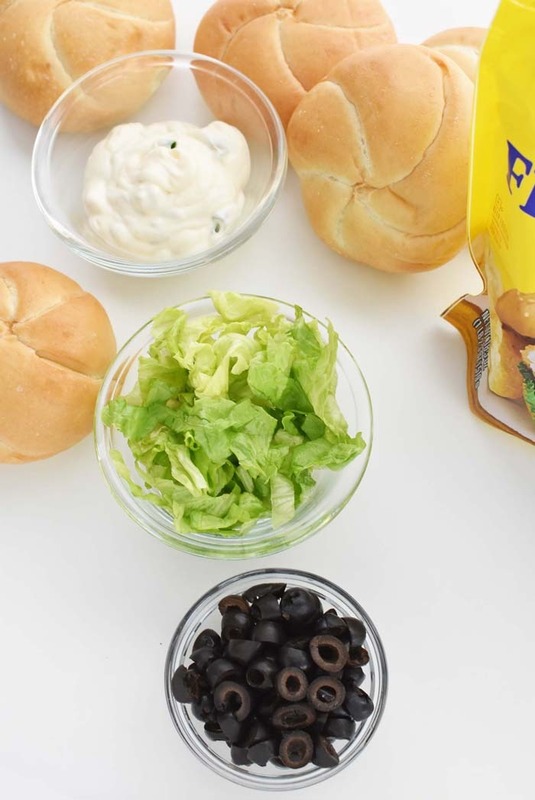 All of these flavors tuck perfectly inside a fresh baked kaiser bun. Tell me these do not look scrumptious? 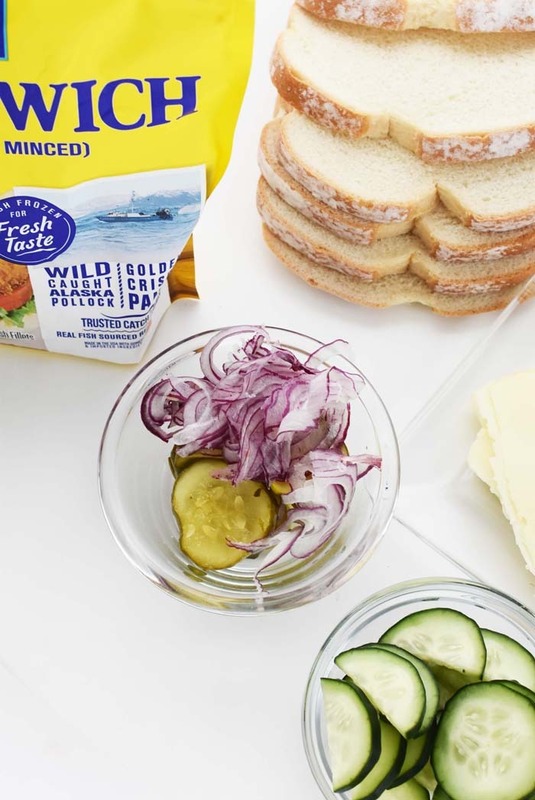 If you would like to make the New England Style Fish Sandwich get the printable recipe below! 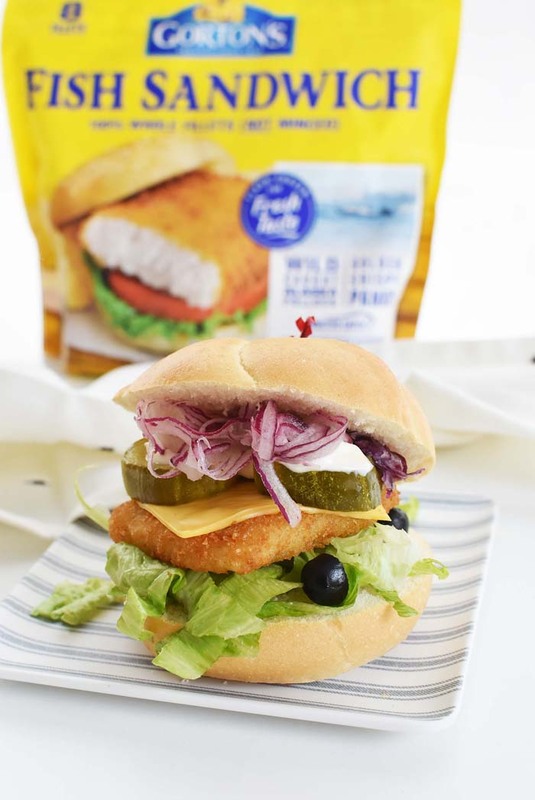 A Crunchy and delicious fish patty tucked into a fresh bun with all the perfect veggie pairings to boot! 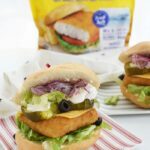 These fish sandwiches look so good! 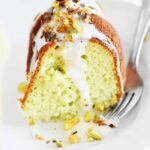 I love the addition of the avocado! Avocado on a fish sandwich? That sounds delicious! I’m game! These are some spectacular sandwiches. oh my goodness that looks so good! i’m not a fan of avocado but have been eating a lot more fish to get my protein in after my workouts. i have to try this fish sandwich! How awesome! I love both of your sandwich options, as well as your creativity. I’ll take mine with the works, please! I am a huge Groton’s fan. And they care! They use wild caught fish when they can, and that is healthier, and helps to sustain the fish population. It has been a while since I’ve had a fish fillet sandwich! I will have to pick some of these up for my kids this week; I always loved this brand! Now I am inspired. I have been trying to get creative as a pescatarian and I have been making veggie burgers but didnt think to make a fish sandwich! I absolutely love these fish sandwiches. I love that you have featured some variety! 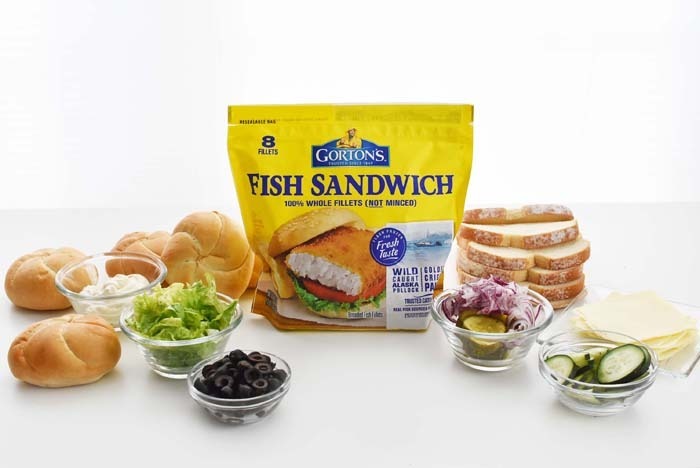 I love Gorton’s brand and have been eating their fish since childhood. 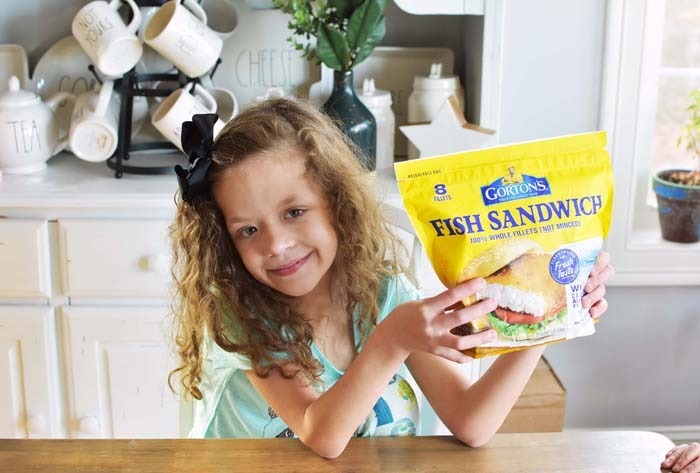 I am going to try giving my kids fish sandwiches with your suggestions. Thanks! I love the many ways you can prepare fish fillet! 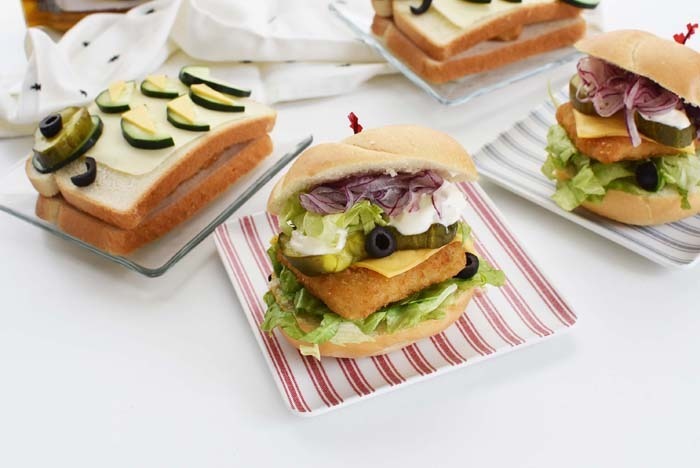 And definitely your New England style fish sandwich is on the top of my list! Thanks for sharing! 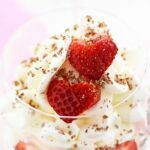 Thanks for your healthy recipe! 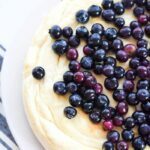 It’s so easy to do and seems so yummy! Hope to try this fish sandwich later!